Another case of gambling not paying off ? Nothing new under the sun with such huge sums at stake. Thank heaven Argyle are run by Brent who had the good sense to only rack up 50 billion dollars worth of unseen debt on his sustainable Citi watch. Maybe Villa bosses could play the "we could see the market was about to make a correction" card, scoot off a la Brenty, and leave everyone else with the problems. its going to take a major casualty to be declared obsolete before the football world wakes up and realises that the buisness models have to change. 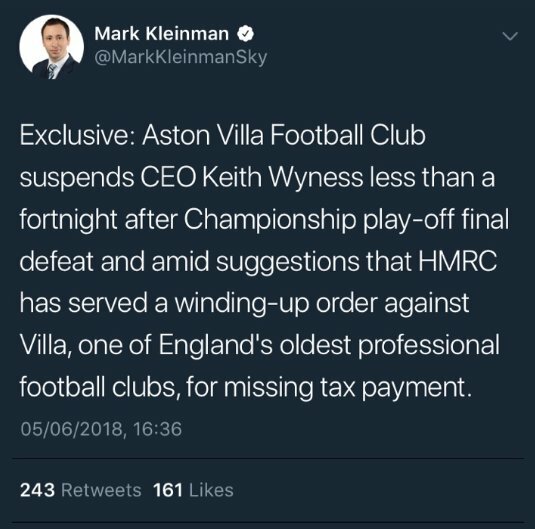 of course they wont do it but still clubs like villa being declared bankrupt should be a wake up call. Little chance of that, given the likes of Rangers, Pompey, Bristol City, Cardiff turned into footballing basket cases and are still going strong. There not the kind of clubs i was referring to really. More the likes of Villa, Leeds United Forest all clubs that have rich history and big fan bases and seen as big clubs in the eyes of other football fans and the media. Subject: Re: Is it Villa next?